Goodall has received numerous awards for her humanitarian and environmental work, and is a UN Messenger of Peace. She co-founded the Jane Goodall Institute in 1977, and later founded the Roots & Shoots youth group to provide an accessible way for younger generations to get involved. An active environmentalist, she has endorsed the Forests Now Declaration, and is a patron of the Optimum Population Trust. She is a former president of Advocates for Animals, an organization that campaigns against the use of animals in medical research, zoos, farming and sport. Goodall was a presenter at Live Earth. At the age of 26, Jane Goodall traveled from England to what is today Tanzania and bravely entered the little-known world of wild chimpanzees. She was equipped with nothing more than a notebook and a pair of binoculars. But with her unyielding patience and characteristic optimism, she won the trust of these initially shy creatures. She managed to open a window into their sometimes strange and often familiar-seeming lives. Her early findings—that chimpanzees make and use tools, eat meat, and engage in war-like activity—profoundly altered our understanding of what it means to be human. Today, Dr. Goodall’s work revolves around inspiring action on behalf of endangered species, particularly chimpanzees, and encouraging people to do their part to make the world a better place for people, animals and the environment. 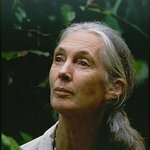 The Jane Goodall Institute, which Dr. Goodall founded in 1977, works to protect the wild chimpanzees of Gombe National Park in Tanzania and other parts of Africa, but recognizes this cannot be accomplished without a comprehensive approach that addresses the needs of local people who are critical to chimpanzee survival. The Institute’s community-centered conservation program in Africa (TACARE) includes sustainable development projects that engage local people as true partners. The program began around Gombe in 1994, but has since been replicated in other parts of the continent. Jane Goodall’s Roots & Shoots, which Dr. Goodall started with a group of Tanzania students in 1991, is today the Institute’s global environmental and humanitarian youth program for young people from preschool through university with hundreds of thousands of members in more than 120 countries around the world. Members of Roots & Shoots California groups attended the event and escorted Dr. Goodall to the podium. Google trends for "Jane Goodall"